Suzanne, a 'newbie blogger' had a 'be the 100th Follower" post/gift which caught my attention just as I was checking her blog WhyCuzICan. I looked at her Followers, there were 99. Checked my Dashboard blog following list, I wasn't a follower on her blog. Followed. I was # 100. 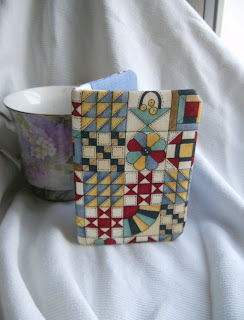 Picked out, from Suzanne's SuziMoose Etsy's Shop a business card holder. Shades of vintage and collectibles. Check out Suzanne's blog and Etsy Shop. Not so very 'newbie' anymore. Congratulations on (now 101) followers. Hi Joy! :) Thanks for the kind words! It just snuck up on me that I was like at 99 Followers so I quickly did a 100th follower giveaway. So glad you won. Is the quilt sample holder the one you picked for your prize? If so, send me your addy and I'll get it mailed this week. I don't have many holders up now, but I can list more pretty soon. Thanks Suzanne. Hope you got my email. Congrats on your new goodie from Suzanne. How wonderful for you!! I am going to pop over there now! You find THE most interesting blogs....and I follow right along behind you!